“The Grave” is a mystery-suspense series about a reality in which two parallel worlds co-exist. A concept upheld in our world only by lunatic physicists becomes actual reality in this series, which alongside supernatural crossings between realms, rewinding time, and morphing physical realities, also raises questions regarding the human desire to change and control our fate, moral dilemmas, and the difficulties of dealing with loss and grief. “The Grave” presents an ensemble of characters introduced by fate, led by Yoel, a nature reserve ranger and former researcher of parallel universe theories, who is forced to face a trauma from his past, which will send him on a redemptive journey; Nico, a mentalist haunted by flashes of his own terrible actions, which he cannot have carried out himself; Avigail, a young prison inmate charged in a complex, mysterious murder case; and Chava, the stubborn, resourceful police investigator, who puts all the pieces together and opens this Pandora’s box: a secret, controversial project funded by the governments of both parallel worlds, where anyone involved pays with their lives, or worse – their fate. The series is filmed using a rich and contrasting visual language. 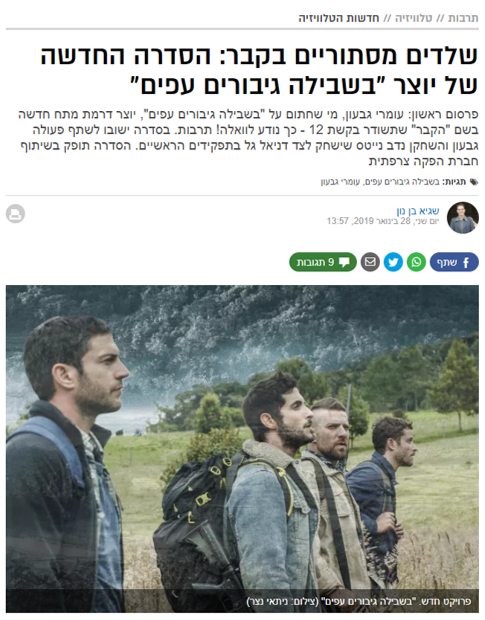 The stories will take place in the wild nature and grassy hills of Northern Israel, beside dismal and claustrophobic prison cells; the bustling streets of Tel Aviv, juxtaposed with graveyards; a colourful palette flowing from warm, vibrant locations, alongside the cold, gray color schemes of the morgue; impressive, epic footage of supernatural phenomena integrated with an intimate, chamber feel. The series will entwine “cinematic” suspense and action scenes with multiple layers and threads. But, even more so, the series will deal with the experience of parenthood, and the feelings that accompany it, feelings of responsibility and guilt, a powerful protective instinct, an intense unconditional love that can lead to extreme choices. It will attempt to challenge us to re-examine our moral compasses and ask ourselves – how far would we go for those we love?